I read this book under such lovely circumstances: a week holiday to Grande Prairie at my sister-in-law’s invitation, with plenty of time to myself, especially on the 11+ hour bus rides. I am still on the bus going back. The bus lost all but first gear shortly after Wetaskiwin, so for the past hour as I finished the novel, we’ve been lazily rolling along the highway at about 15 kilometres per hour. What an interesting, fully integrated story! How fascinating to follow the surprising twists and turns and revelations in the lives of these two families. What a talent the author has in coloring the tale with so many clearly drawn and endearing, exciting and amusing characters. I will study Jane Austen’s methods of revealing emotions, and creating suspense throughout, for my own writing. Of course, I couldn’t wait to read it whenever I had the chance, and always had that sense of calm anticipation and pleasure, which is half the fun of a 400-page book like this. I regret that I didn’t press on the first time I attempted to read it years ago; I gave up because of the confusion of so many characters. After seeing the movie, all the characters were clarified in my mind, but that sadly removed the joy of unveiling each turn of the plot in the book. I did distance myself from the story by waiting about six months since seeing the movie before reading it, and have been very impressed with myself for resisting opening the DVD that has been sitting on my bookshelf still wrapped in plastic for the past few months and watching it for the fourth time! To fully immerse myself in the experience, I listened to the soundtrack from the movie all the way up to G.P. as I read about half of the novel. (It’s probably my most-listened-to CD since I bought it.) Although my greatest reaction to this work happened while watching the movie, as that was my first thrill of knowing the story, it was interesting to read the variances in the novel and the details of the thoughts and emotions. By the time I got to the latter chapters, I didn’t want to read anymore of the long letters (there were over 20 of them! ), but I did read every word of them, and they were full of revelation. The Afterward was interesting in that it pointed out the prim and proper narration and character appearances contrasted with the improper attitudes and actions. 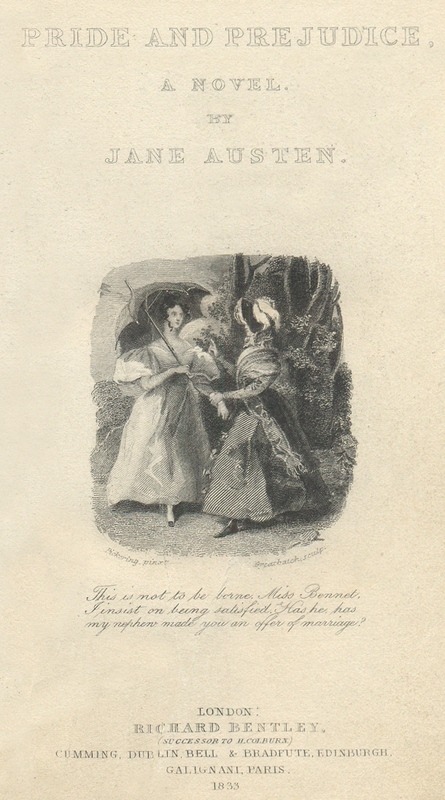 The novel clearly showed a change in Darcy’s character as he is humbled by Elizabeth’s scolding , and transforms from being a rude, self-centered, judgmental man, to a more accepting, generous, polite one. (The movie showed nothing of that.) It showed Elizabeth also being humbled, ashamed and remorseful over her prejudice and her spreading ill will toward Darcy. The book far, far more than the movie indicated how vast and strong her feelings were toward him, and since she’d transferred these bad feelings to her family, how great was her challenge to suddenly transform their opinion of him when they discovered their love for each other. Awesome and excellent, Ms. Austen!